Once upon a time, long ago, when I lived in Kabul, I was shocked when I first saw a woman wearing a burqa. I was twenty years old but had grown up in New York and considered myself something of a worldly intellectual. True, the women in my family did not wear burqas—but they did wear attractive head scarves, long coats and gloves. True, at home, the female servants were not in burqas; they would not be able to work. True, female agricultural workers or female servants on errands did not always wear burqas—but if a male stranger passed by they would quickly, deferentially, turn their faces away and hide their faces in their headscarves. And, I was there in the "salad days" when returning Afghan college students were hopeful about the future of Afghanistan, and who even now, in bitter exile, remember the 1960s and 1970s as a time when Afghanistan had flourished and began to modernize. Well, for what it's worth, democracy exists in Afghanistan (ha!). But today, women voted there. 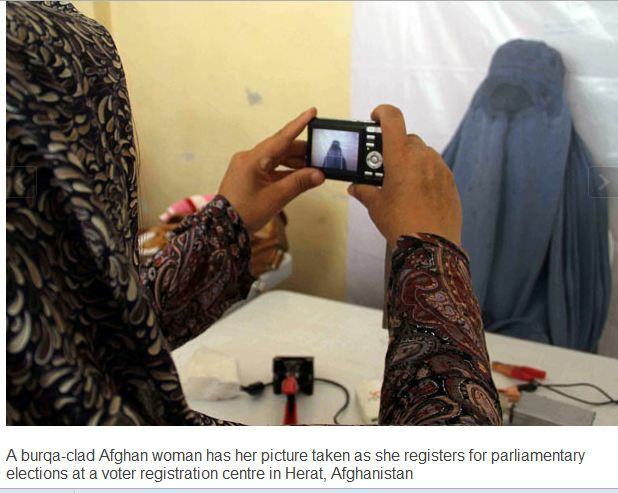 Here is a photo of a woman registering to vote in Herat. Clearly, she thinks this is an important moment and wants to have a photo to remember it. Tragic, comical, ironic, pathetic. This is a photo of non-existence, of erasure, proof of invisibility—but also of pride and "agency." This woman chose to vote and to take a photo of herself. I am tearing my hair out over this one. This photo is the photo of the day at the London Telegraph.